Heath Wolfson, CEO of Tattoo Nation LLC, opened the first ever U.S. mall-based tattoo shop in a New Jersey mall in 2006 (they love their malls there, man), reports an article that ran in the Small Business section of The Wall Street Journal. “Our goal is to have 400 stores—to be as common as Victoria’s Secret,” says Wolfson, 31. Wolfson’s N.J. mall shop has been profitable so far and plans to open two more in New York malls in early ’09, but the reporter pointed out that this could be hard to pull off in an uncertain economy. The article also brings up how traditionally artists work as independent contractors within a shop and split their proceeds 50-50 and that it’s been hard to persuade “temperamental, independent-minded tattoo artists that they wouldn’t be selling out to join mall–based shops.” Wolfson lured the artists with benefits like medical insurance, paid vacation and supplies but did away with the 50-50 pay split for salary plus commissions and bonuses. This caused 2 out of 3 artists to bail out but he reports no staff turnover in the last 18 months. Maybe the new ones heard about the mall-employee discount at Cinnabon. 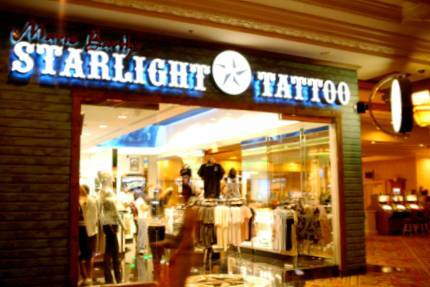 The WSJ article also talks about other tattoo chains, like Mario Barth’s Starlight Tattoo mini chain that’s in Jersey, Spain and the Mandalay Bay Hotel in Vegas (pictured below, notice the slot machines on the right). Another chain is Hart & Huntington, Hart being motocross rider Carey Hart, which is in the Palms Casino Resort in Vegas, Hawaii, Mexico and Florida. The article is chock full of fun facts, like that Tattoo Nation’s leasing agent circulated to developers an article about Meghan McCain’s star ankle tattoo to show them how mainstream tattoos are and that Mario Barth drives both a Bentley and a Lamborghini. And someone made an awesome comment about McTattoos being the future of this industry on wsj.com. I would like to end on the personal note that I’ve been to Claire’s in the mall to get my cartilage pierced and nothing is scarier than a shaky 17-year-old with a piercing gun pointed at your head. Check out the slideshow on the WSJ site for pictures of Tattoo Nation and Starlight Tattoo’s New Jersey locations.